The beauty of staying here is having the forest so close – it's only 150 metres from the house to the start of well-maintained tracks through the trees and ferns. Wake up early and open the window or sit on the deck and enjoy the birdsong. It's mountainbiking paradise; ride from the house through forest to the start of NZ's best mountainbiking tracks - hundreds of kms of trails. The Redwoods Visitors Centre and redwood forest is a short walk or ride away. The house is right by a bus stop to town, and a block and a half away there’s a big park and kids’ playground. Motion Entertainment, a new indoor entertainment complex, is 15 minutes' walk away. Four lovely lakes, Okareka, Blue, Green and Tarawera, are 10-30 minutes' drive - swimming and picnics. All included, unless I'm away, is my homemade fresh bread and coffee beans for you to grind - I'll leave them at the back door each morning. The kitchen has everything you need for cooking and baking, and the dining area opens onto a large sunny deck with gas barbecue. There is a wide variety of takeaways/restaurants nearby at the Redwood Shopping Centre and Lynmore Junction. For entertainment there's a home theatre system, a fairly eclectic selection of books, internet (free unlimited fibre WiFi and computer) and some classic board games. Secure garage, tools, bikestand, air compressor for your mountainbikes. The garden’s one of my hobbies; visit at the right time and you'll get tree-ripened fruit. Linen’s supplied and the beds have decent mattresses. You're welcome to pop by my place for info, or if you’ve forgotten supplies I can help out. Otherwise, I’ll be unobtrusive, just using the garage occasionally. I've lived in Rotorua for ten years, working as a technician/scientist at the government Forest Research Institute (Scion). I love being outdoors, mountainbiking or walking in our beautiful forest or hiking further afield anywhere there are mountains. Before settling in Rotorua I spent some time living and travelling in Latin America. I couldn't resist this house, with its timber interior and garden space which I've made into something I enjoy, and its proximity (200 metres away) to the forest. My workplace is just a short bikeride along the edge of the forest - what better commute could there be? There was space on the property to build a cottage for my parents, where they lived until they passed away, and where I live now. Lynmore is a sought-after suburb in a very attractive small city. wood burner (low emission) with firewood supplied - you may need to chop kindling to start the fire. 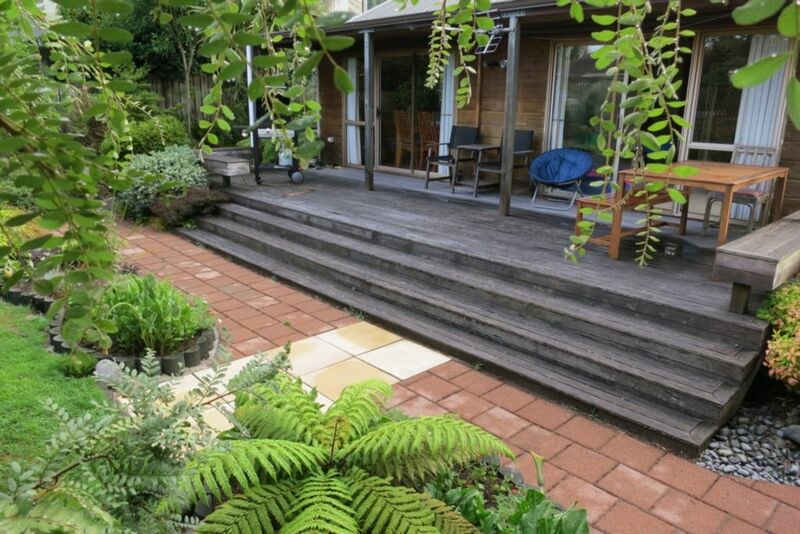 Garden is mostly New Zealand native plants, with a few fruit trees and a small lawn space. Lovely home with everything you need. Host was lovely n went above and beyond to help us out. The bread, coffee, and milk! This host goes out of his way to make your stay special. Loved walking in the redwoods every morning! Great location and very charming. Like a home away from home, great location, peaceful and well equipped. The extra touches like fresh bread and coffee beans every morning was lovely. Would definitely recommend! The house was perfect for our needs - close to every activity we did - cycling in the redwoods, attending The Great NZ Quilt Show, shopping and eating out. The beds were super cosy and there was little traffic noise. That bread delivered fresh each morning was filling and delicious - a touch we've never experienced at other accommodation. A great family home where we could relax and enjoy the space. Would be great for families and would stay there again. Spent four nights at Lynmore Lockwood and was pleased with the accommodations. The house was spacious with a large, comfortable deck. The yard was lush with a wide variety of plants and fruit trees. The location provided easy access to the redwood forest and downtown Rotorua. Overall, it was a very good value. However, don't be misled that this property is in a rural area. It is in a densely populated neighborhood and has a relatively small yard (although it is landscaped beautifully). It is on a fairly busy street. Also, one of the bathrooms is split between two rooms that are not connected. One tiny room has a toilet and the other room has a shower and sink. We ran into this bathroom configuration in another property we rented in New Zealand, so this may be a common configuration in New Zealand. Yes, the house is definitely within Rotorua City, although Lynmore suburb, where the house is located, is very typical older suburban New Zealand, where all of the houses are detached and have gardens and lots of green space - no apartments or high density living. The separate toilet/bathroom configuration is very common in New Zealand - many houses have one en-suite bathroom, plus another bathroom to serve the remaining bedrooms, and a separate toilet so that bathroom and toilet can be used independently. Lynmore is a quiet, green and sought-after suburb to the east of the main town centre, bordering on the renown Redwoods (a visitors' centre, many beautiful walking tracks and an aerial tree walk) and Whakarewarewa Forest (New Zealand's best mountainbiking trails). There are cafes and food outlets nearby, as well as an indoor entertainment centre.